<h2>Gravitational waves detected, scientists announce</h2><br /><p>The research paper, published on 11 February in <a href="http://journals.aps.org/prl/abstract/10.1103/PhysRevLett.116.061102#fulltext" target="_blank" rel="noopener noreferrer">Physical Review Letters</a>, was co-signed by nine EU-funded researchers, who are working in the gravitational research environment thanks to a Marie Skłodowska-Curie training programme called GraWIToN.</p> <p>‘I am delighted that EU research funding has once again supported an exciting scientific breakthrough in cosmology, confirming Einstein's predictions about spacetime in his General Theory of Relativity,’ said Tibor Navracsics, European Commissioner for Education, Culture, Youth and Sport.</p> <p>‘I would like to congratulate all the scientists and researchers supported by the Marie Skłodowska-Curie Actions who are behind the detection of gravitational waves announced today.’</p> <p>Gravitational waves are vibrations in the fabric of spacetime caused by the acceleration of objects in the universe. 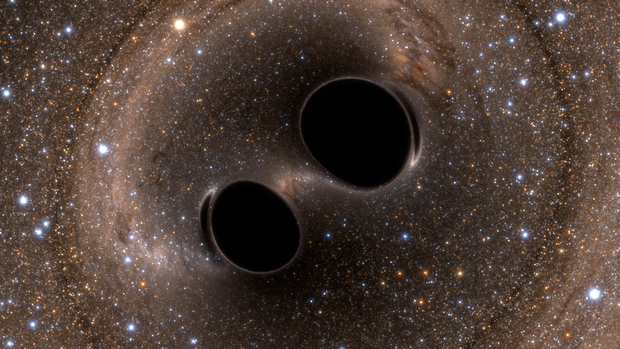 Their existence was predicted 100 years ago by Albert Einstein but this is the first time they have been detected.</p> <p>‘I think we’re opening a window into the universe, a window of gravitational astronomy,’ said Professor David Reitze, executive director of LIGO, at a press conference to announce the discovery. ‘We may see things that we never saw before.’</p> <p>A strong gravitational wave produces a movement that is 1 000 times smaller than the diameter of a proton, meaning that the detection equipment needs to be extremely sensitive and the masses causing the ripples need to be extremely large.</p> <p>Researchers at the European VIRGO device near Pisa, in Italy, who&nbsp;jointly analysed and published the LIGO data, hope their detector&nbsp;will be able to join in making measurements later this year. &nbsp;</p> <p>The recently detected gravitational waves were caused by the merger of two black holes with equivalent masses of 29 and 36 times the mass of the sun, orbiting in a binary system. The collision happened 1.3 billion years ago at half the speed of light, and it also confirms indirectly the existence of binary systems of black holes with equivalent mass greater than 25 solar masses.</p> <p>As they merged, a burst of gravitational waves was produced which eventually passed through earth, stretching and compressing the planet on an infinitesimal scale as it did so.&nbsp;The generated waves were very small, and they needed a system capable of measuring distortions one-thousandth the size of a proton to be detected.&nbsp;</p> <p><strong>Information</strong></p> <p>Because gravitational waves contain information about the motion of the masses that created them, scientists can now use them to learn more about how the universe behaves.</p> <p>Specifically, because gravity existed long before light and isn’t distorted by objects in its path, the waves will enable us to observe further back in the history of the universe than ever before.</p> <p>LIGO research is a collaborative process involving 1 000 scientists from 15 countries, while VIRGO involves around 250 scientists from five European countries. The GraWIToN researchers contributed to the data analysis and technological development necessary for the breakthrough.</p> <p>The GraWIToN project began in 2014 and is designed to allow 14 early stage researchers to gain experience at gravitational science research institutes such as LIGO and VIRGO.</p> <p><img class="@align-center@" style="font-size: 13.008px; line-height: 1.538em;" title="Nine early-stage researchers, funded by the EU’s Marie Skłodowska-Curie actions, have co-signed a paper on the detection of gravitational waves. First row (left to right): Matthieu Gosselin, Shubhanshu Tiwari, Gang Wang; 2nd row (left to right): Imran Khan, Justus Schmidt, Daniel Töyrä; 3rd row (left to right): Serena Vinciguerra, Jose M. González, Akshat Singhal. Photos courtesy of GraWIToN consortium" src="/sites/default/files/Researchers.jpg" alt="Nine early-stage researchers, funded by the EU’s Marie Skłodowska-Curie actions, have co-signed a paper on the detection of gravitational waves. First row (left to right): Matthieu Gosselin, Shubhanshu Tiwari, Gang Wang; 2nd row (left to right): Imran Khan, Justus Schmidt, Daniel Töyrä; 3rd row (left to right): Serena Vinciguerra, Jose M. González, Akshat Singhal. Photos courtesy of GraWIToN consortium" width="800" height="800" /></p> <br /> <img src=”http://www.google-analytics.com/collect?v=1&tid=UA-40077089-1&cid=gravitational-waves-detected-scientists-announce&t=event&ec=republish&ea=read&el=gravitational-waves-detected-scientists-announce&cs=republish&cm=republish&cn=republish&cm1=1" /> This post <a href="https://horizon-magazine.eu/article/gravitational-waves-detected-scientists-announce.html">Gravitational waves detected, scientists announce</a> was originally published on <a href="https://horizon-magazine.eu/">Horizon: the EU Research &amp; Innovation magazine | European Commission</a>. Gravitational waves have been detected on earth for the first time, researchers at the Laser Interferometer Gravitational-wave Observatory (LIGO) in the US and the VIRGO detector in Italy have announced. The research paper, published on 11 February in Physical Review Letters, was co-signed by nine EU-funded researchers, who are working in the gravitational research environment thanks to a Marie Skłodowska-Curie training programme called GraWIToN. ‘I am delighted that EU research funding has once again supported an exciting scientific breakthrough in cosmology, confirming Einstein's predictions about spacetime in his General Theory of Relativity,’ said Tibor Navracsics, European Commissioner for Education, Culture, Youth and Sport. Gravitational waves are vibrations in the fabric of spacetime caused by the acceleration of objects in the universe. Their existence was predicted 100 years ago by Albert Einstein but this is the first time they have been detected. A strong gravitational wave produces a movement that is 1 000 times smaller than the diameter of a proton, meaning that the detection equipment needs to be extremely sensitive and the masses causing the ripples need to be extremely large. Researchers at the European VIRGO device near Pisa, in Italy, who jointly analysed and published the LIGO data, hope their detector will be able to join in making measurements later this year. The recently detected gravitational waves were caused by the merger of two black holes with equivalent masses of 29 and 36 times the mass of the sun, orbiting in a binary system. The collision happened 1.3 billion years ago at half the speed of light, and it also confirms indirectly the existence of binary systems of black holes with equivalent mass greater than 25 solar masses. As they merged, a burst of gravitational waves was produced which eventually passed through earth, stretching and compressing the planet on an infinitesimal scale as it did so. The generated waves were very small, and they needed a system capable of measuring distortions one-thousandth the size of a proton to be detected. Because gravitational waves contain information about the motion of the masses that created them, scientists can now use them to learn more about how the universe behaves. Specifically, because gravity existed long before light and isn’t distorted by objects in its path, the waves will enable us to observe further back in the history of the universe than ever before. LIGO research is a collaborative process involving 1 000 scientists from 15 countries, while VIRGO involves around 250 scientists from five European countries. The GraWIToN researchers contributed to the data analysis and technological development necessary for the breakthrough. The GraWIToN project began in 2014 and is designed to allow 14 early stage researchers to gain experience at gravitational science research institutes such as LIGO and VIRGO.